We think that Crystal Downs Country Club was inaugurated in 1927 and the course opened for play in 1929 but we’re not really sure. Some publications suggest the layout opened in 1932, but you must be in the know and on the inside to fully appreciate and understand Crystal Downs. Crystal Downs is set delightfully on a headland that is wedged between Lake Michigan and Crystal Lake in America’s Midwest. The course was originally designed and routed by Alister MacKenzie and Perry Maxwell, but it was Maxwell who was entrusted to do most of the hard work. “Mackenzie, who was making his way back across America with the intention of returning home to Scotland, along with his then associate Maxwell, was talked into a trip to the wilds of Northern Michigan.” Wrote Mike Stachura in American Classic Courses. “What they saw once they got to this pristine golfing land set on a 100-foot-high sand-ridge overlooking both Crystal Lake and Lake Michigan was an opportunity to work a magical piece of property. Renaissance Golf Design was involved with improvements to the 13th green and 14th tee before expanding the 2nd green in 2017. Hole locations in the middle and back tiers of of the 11th green were then scheduled for extension the following year. This masterpiece is a national treasure. Crystal Downs is consistently near the top of golf course rankings and it is well deserved. While there are no weaknesses to the course, the greatest highlight is the greens. They play fast and have a lot of slope in spots. It requires some shotmaking strategy to hit the right part of greens or miss in the right spots. The front of the green is a good bailout on most greens, but lag putting is still not easy. The views are beautiful from the tee boxes and the terrain is perfectly suited for golf. There are some very unique holes, such as the famous split fairway 5th and the 17th. If you love golf architecture and fantastic greens, this is a must visit. The terrain that Crystal Downs is built on is hilly. Very hilly. On a par with a better known hilly course: The Olympic Club. At times when walking Crystal Downs you feel like a Billy goat. The course was co-designed by Alister MacKenzie and Perry Maxwell, who also designed Southern Hills and Prairie Dunes. I also see a lot of similarities between the fairways at Prairie Dunes and those at Crystal Downs. It looks like Maxwell had a lot of influence on the fairways and MacKenzie had a greater influence on the greens. 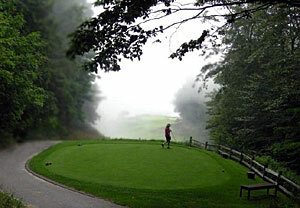 The greens at Crystal Downs are difficult enough because the course is built among the hills. The undulations and contouring that Mackenzie and Maxwell added in make them very challenging indeed. One of the things you discover very quickly playing Crystal Downs is that there is a premium placed on putting well. The seventh hole has a tree in front of the green in the middle of the fairway. A well struck tee shot in the fairway requires you to hit over the tree onto a small undulating green. At 335 yards, you only have a short iron to the green, so it's a fair shot and genuine fun. The next hole, the 8th, on the other hand is a patently unfair hole. Clearly the most difficult handicap hole on the course, and by a lot. Sometimes an architect can go too far and I feel that they did so on this hole. 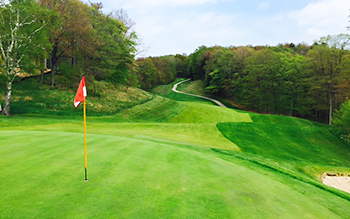 The hole is a 550-yard par five that plays uphill, uphill and then uphill with wild slopes throughout the fairway. The green slopes from back to front and is very difficult to hold. Once on the green, it is too fast to hold putts. I experienced the MacKenzie camouflage effect at Crystal Downs. I didn't find that I hit into many of the bunkers, but their presence really causes you to aim your shots in the wrong direction in a subtle way. On the 12th hole the tree that appears to be in the middle-to-right side of the fairway from the tee is amazingly on the left side of the fairway when you get up to it. On the 4th, 5th and 6th tee shots you almost don't know where to aim off the tee, there is such a mix of trees, bunkers, severe hills and native grasses. Crystal Downs justly deserves its world ranking as one of the best golf courses in the world. Several months ago I became the very fortunate recipient of an invite to play Crystal Downs. This is the kind of honor you immediately book overseas flights for and that is exactly what I did! One word describes it to perfection, AWESOME! As far as US parkland courses go Crystal Downs in one of the very best without a doubt. It’s one of the few courses I’ve played in the Top 100 where I was able to remember every single hole upon completion of my round. Every hole at Crystal Downs is unique and presents you with a tough challenge. Uniquely not by being long but by placing a premium on strategy. The set of greens are spectacular but quite severe which definitely demands your respect when standing on the tee as much or more than any course in the world. Think greens severely tilted right to left that need to be approached from the left hand side of the fairway to have any chance at holding them. Think hitting your approach above the hole and then having to figure out a way not to putt the ball off the green. Crystal Downs as best as I can assess requires serious study to be able to play well and understand all the intricacies of. It also requires a lot of talent to post a decent score. To offer up an idea as to the how challenging the greens are, I’m a mid single hcper and can easily say putting is my strength and one of my favorite parts of the game yet Crystal’s greens are still laughing at me and I could hear my playing partner thinking don’t say I didn’t warn you. Crystal Downs is a schizophrenic experience. The front nine shows all of Alister MacKenzie’s skills at routing, bunker design and shaping undulating greens. Most of the back nine, however, is comparatively mundane. While often included in the top ranks of MacKenzie courses, it does not fit at all in the company of Cypress, Royal Melbourne West, ANGC or New South Wales. Mackenzie arrived here on his way from California to England and local lore has it that he was quite sullen on the drive up from Grand Rapids. On seeing the land below the clubhouse, where a rudimentary nine hole course had been laid out by a local landscape architect, he brightened considerably. There he built nine new holes taking superb advantage of the rather hilly ground to find excellent green sites and provide strategic alternatives for tee shots. Number 7 is the finest example of the latter with its unusual boomerang-shaped green. The tee shot on number 5 provides four different routes and there is little consensus among members as to which is the most advantageous. After completing detailed drawings, Mackenzie left the implementation to colleague Perry Maxwell. Alas, the land allotted for the back nine did not offer MacKenzie the opportunities he found on the front. While there are strong holes at 11, 17 (a driveable par 4), and 18 (with its Cape hole drive), most of it is on comparatively featureless land. Moreover, the out and back routing contrasts greatly with sinuous layout on the front. The greens are usually very quick, with 11-11.5 the Stimpmeter target when the weather allows. Combined with the Perry Maxwell "rolls", there are many opportunities to putt the ball right off the green. Needless to say, leaving approach shots below the hole is of paramount importance. The running game is on at almost every green site, which does helps with that challenge. The front nine rates 6 balls on the Top100 scale, but the back only 4. Maybe the best "short course" in the world. 1yr later and I still think about the 4th tee shot--"what should I hit off the tee?" and the 7th green---"are you kidding me? "The 8th is widely considered a great par 5, and the 11th is a green where you could have an uphill 4 footer and end up with a 40yrd pitch. I also love the 9th, both for it's uphillness, proximity to the clubhouse, and treacherous green and heather.Due to it's location, this course doesn't get it's due, but it's also part of the charm. Club pro Fred Mueller and his family are the gatekeepers for this quaint and world class golf course. Alister MacKenzie, in my opinion, is the greatest golf architect to ever shape raw land into a golf course. He designed Augusta National, Cypress Point, Pasatiempo, Valley Club, and Crystal Downs, among others. He and Robert Trent Jones Sr., are the only two golf course architects to have been inducted into the Golf Hall of Fame… I had heard nothing but great things about Crystal Downs in Frankfort, Michigan, and I was looking forward to it with more anticipation than any other course on the Top 10 list. Finally I pulled up the entrance drive to the soaking wet, nearly deserted golf club on the shore of Lake Michigan. As I feasted my eyes on Crystal Downs, my thoughts of “beautiful day, beautiful drive, even if I don’t get to play” went right out the window. “This place looks awesome and I really want to play here,” I thought. The clubhouse is underwhelming, and the pro shop is simple and functional. Crystal Downs is all about the course, not opulent amenities, and it’s one of golf architecture’s relatively unheralded masterpieces. Larry Berle. Arguably the best front nine in all of golf. This is the most original MacKenzie course in existence with only 2 additions (not changes) to the golf course since its creation. The club added a back tee on the par 3 3rd hole and an alternate back tee on the par 4th hole. Downhill opener to a deep slither of a green lets you know that you’re in a big test right from the get-go. The prevailing wind is from the South, but if you’re unfortunate enough to be downwind on the 1st hole, you’ll quickly turn around and come back up to the 2nd hole into the wind which is not fun or easy. You just have to be brave on these greens as your patience will be taken to levels you didn’t think possible and your depth perception will go through a MacKenzie examination as soon as you step foot on the 1st tee. Holes 5 through 7 are all less than 380 yards but don’t let the yardage fool you. Any major winning pro would happily take par on this stretch. The 8th hole is an uphill par 5 and the local comment is “this is a 3 shotter, and each shot gets progressively harder”. Never have truer words been spoken. Like most top rated MacKenzie courses, par on any of his holes is a terrific score – so don’t come here with an attitude of superiority as you’ll be the one reaching into your wallet after 18 holes to pay off your debts. The only hole on the property which needs attention is number 13. It’s a par 4 with a forest on the right side, hitting to a green which severely slopes left to right with a over-sized mound on the left side of the green. This is not natural and not as MacKenzie designed it. Word on the street is that an architect is coming in to reduce/repair this green and return it to how it was supposed to be played. This green really doesn’t make sense and is not favoured by the members. Walking many of the greens, you’ll see red paint marks indicating the clubs plans to tweak the shape and scope of the greens to ensure they return to the original dimensions. The endless debate of which course has the best set of par 3s will go on forever, but on US turf, the par 3s at Crystal downs are epic. There are just world class holes everywhere the eye can see and this place will reset your interpretation of golf perfection. If I could play one course for the rest of my life, it would be Crystal Downs. I could not agree more strongly with this reviewer's comments. I have played CD at least 70 wonderful times since 1990 always savoring the subtleties of the greens in every round. Although the course plays to a mere 6700 yards on any given day, be you not fooled about the course's need for distance and a gentle touch around the greens. I too, having only one golf course to play for eternity, would gladly choose old CD! Crystal downs is quite simply a tough test of golf......the undulations used by Mackenzie and maxwell make the shotmaking on this course a must. The views from some of the higher tees are extraordinary. The fairways work both left and right and the greens roll true and fast. As a result you must place your shots in locations where u can attack the pin. And make sure that those placements are below the hole......2 of the 4 people I played with landed their ball near the hole on the 10th green and were welcomed with a chips shot from over 15 yards off the front of the green.....Some real memorable holes are the par 4 5th over a blind ridge to the fairway, the par 3 9th uphill to a small green that slopes back to the tee (bring an extra 2 clubs), the par 4 10th off a high tee then up the hill to a very difficult green to hold and the par 3 14th that looks out over the northern woods to lake Michigan........quite a viewIt is not an easy course to get to but well worth the trip....make it a must play. Well, there's not much else that needs to be said. I've played a lot of courses and The Downs is in that elite upper echelon. If you appreciate good architecture you simply must have a game there. MacKenzie and Maxwell were granted a wonderful canvas upon which to craft a layout. The front nine gets more praise but the back nine is subtly good. Pay attention to the details as you play the course. And one more thing, stay below the pin. Crystal Downs is an enigmatic place as there is a spectacular piece of property utilized for the first nine (perhaps the story of the 9th being added as an after thought is true?!?!) holes which is utilized in such a way that there are so many fantastic play holes using natural terrain that one cannot wait for the second nine. Overall, I have to say that if one critically evaluates the golf course it has several flaws that often get swept aside in the flush of narcosis that envelops players on this course. Many of the greens are spectacular in their designs but the contours combined with the modern agronomic advances have led to a disconnect of several of the greens from their complexes as a whole. Pin positions become unusable, entire greens (#11 in particular) become hazards unto themselves and it stops working as the club insists on extreme greens speeds. This has already led to wholesale changes at Mackenzie's Pasatiempo in California. Will Michigan follow California? Hopefully NOT! Also working against an extremely lofty (top 10 or 20) position for Crystal is the long disconnecting walk up from #11 to #12 and the relative banality of holes 12-16 compared to what has already come afore save some of their greens. After skillfully utilizing such fantastic land as holes 1-11 are built on, one walks straight up a paved path for far too long to reach nearly billiard-table land for a group of generally so-so holes. The par 5 16th is particularly disappointing as it has one of the less interesting green complexes following a virtual pasture of fairway deplete of any and all obstacles. #17 is either brilliant or brilliantly insane, but we do know that with tight fairways the hole will only play one or two ways in the end, sad for such a wonderful hilltop skyline greensite. Number eighteen is rather an ordinary hole with only a modicum of strategic thought required. This certainly is a world-class course, but the mystery of how it remains so highly regarded with such flaws may perhaps be explained by its experiential and comforting qualities that one revels in imaging THIS among all others as one's home course. Never ever pass on an opportunity to play, but there are easily 20 better courses in the USA, perhaps 30.